“Based on everything we’ve seen, Myanmar is likely the biggest meth producer in the world,” states Jeremy Douglas, the regional representative for Southeast Asia and the Pacific for the U.N. Office on Drugs and Crime. From a western point of view, this information might be surprising, as popular drug-related TV shows such as Breaking Bad and Narcos have portrayed our side of the world as the primary producer of drugs. For those more familiar with East Asia, Myanmar’s persecution of Rohingya Muslims might have overshadowed its drug-related problems. However, Myanmar’s meth production deserves recognition as a prominent issue with ramifications across East Asia. Map of Myanmar, with its Shan State region highlighted in red. Myanmar’s meth production occurs in its conflicted Shan State, located near the Chinese border. This area is infamous for its drug production, having lead the world in heroin production for decades until being surpassed by Afghanistan in the 1990s. Its ease of production stems from the safehaven that militias have provided to the area. The Shan State’s meth production has been closely linked to militias since the Chinese Kuomingtang Army’s invasion of northern Myanmar in 1949. The Kuomingtang immediately took control of heroin production and began exporting it to Hong Kong, North America, and Australia. In 1960, China reinforced its support for the Communist Party of Burma, an underground communist organization in Myanmar, who in-turn launched a successful operation to take control over the Shan State. This organization became known as the United Wa State Army (UWSA) in 1989 and was granted territory by the Myanmar government in 1999. 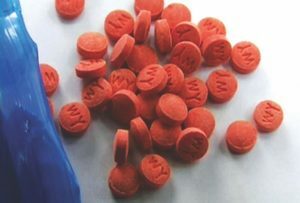 With their newly gained territory and implied autonomy from the Myanmar government, the UWSA focused on heroin production, becoming the dominant drug producer in Myanmar. However, after competition from Afghanistan and increased social awareness of heroin’s danger, they began looking for an alternative drug to manufacture. Meth was their answer. The drug was easier and cheaper to produce, as it didn’t require opium poppy cultivation. Social awareness of meth’s danger was also lower, as the drug is relatively new. In 2010, the UWSA shifted production from heroin to meth, diving into the multi-billion dollar industry. China has been repeatedly blamed for the Shan State’s meth production. The militias who first invaded northern Myanmar originated in China, and the Chinese government has historic ties with the UWSA. In addition, the precursor chemicals that are necessary to meth production are manufactured in southwest China and transported across the border. Despite many calls for government intervention, China has largely remained quiet. This could possibly be tied with their Belt and Road Initiative, which contains massive infrastructure plans along the China-Myanmar border and relies on cooperation from the UWSA. This places the Chinese government in a tough spot: should they crack down on precursor flow and risk infrastructure plans, or continue to ignore the problem and enjoy a tight economic relationship with Myanmar? The U.S. State Department should assist with diplomacy between Myanmar and China, for their drug problems have health-related ramifications throughout Southeast Asia and the Pacific. Representatives should travel to Shan State, Yangon, and Bejing to personally consult leaders in an effort to further investigate this issue and find a solution that simultaneously lowers meth production and establishes a mutually beneficial economic relationship between Myanmar and China.